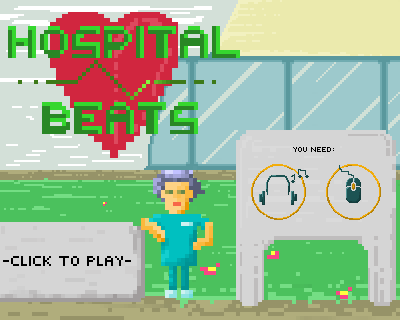 Hospital Beats is a single player game with multiplayer component (by persistence). It’s a fast-actions based management game in which the player must regulate the patients heartbeats. When they lose too much patients, they go mad, have an heart attack and turn into one of the patients that the next player will have to take care of. To play the game, a mouse wheel and headphones are needed. – audio needed for gameplay (to listen to the hearbeats).